A book like this one is of the type that makes me feel like someone watching two boxers beat each other up, knock each other out, each unaware that the prize they were fighting for was already taken by someone else. Rethinking Hell is of the genre of what you could call a "convenience collection" of previously-published materials, assembled in one place for ease. (A very sound tactic I use, too.) Multiple essays here are collected to defend the premise of conditionalism/annihilationism, the idea that human spirits who are not part of Christ's covenant end up annihilated after judgment. Like I said, though, this is one of those things where I'm mostly a bystander. 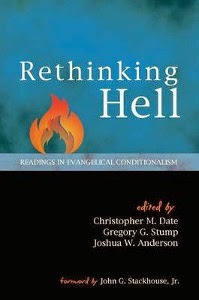 My own view of hell, based in the agonistic context of the New Testament, bypasses many of the criticisms of a literal-fire hell that these varied authors stand against. This view also happens to undermine attempts made by some in this volume to read "fire" passages about hell in terms of annihilation, since such terms already come semantically occupied by another metaphorical fulfillment (that of shame). I did say "some". Others in this volume actually reach close to my view, reading hell in terms of separation from God -- a conclusion they reach without the agonistic tenor, which would end up reinforcing their conclusion even so. At any rate, this and some other material has led me to update my own little volume on hell, which I expect to have ready next month. You should pick this one up if you want to get up to snuff on the debate, even if (like me) you don't buy into the same conclusions. A recent news story from my neck of the woods offers a handy illustration of a sort of poor argument method that characterizes many critics I know -- ranging from "copycat" Christ theorists to those who adhere to the "Mark stole from Homer" thesis. The dome atop downtown Tampa’s SunTrust tower honors sports teams and special events with its multicolored, digital light display. So as the U.S. team opened World Cup play Monday night against Ghana, soccer fans might have been puzzled to look up and see the skyscraper’s dome aglow in stripes of red, yellow and green. Those would be the colors of the Ghana flag . At one time, they also were the colors of Shriners International — the service organization headquartered on Rocky Point that the 500-foot-high LED display was intended to honor. “Basically it’s a coincidental thing,” said Melissa Cronk, assistant general manager for Jones Lange LaSalle, which manages the 36-floor SunTrust Financial Centre. This came to mind because of late, someone has been writing to me asking about some of the arguments of this sort made at "jesusneverexisted.com." The essence of such arguments is that because the critic is uneducated about relevant Biblical contexts, when they see a seeming "parallel" between the Biblical text and something else in the Biblical world, they assume that it can't be a coincidence. By way of illustration, because World Cup dominates people's thinking right now, they assumed that the tricolor feature on this building could not have any other meaning. This is in spite of the fact that these colors (red, yellow, and green) are commonplaces. For all they knew the building was celebrating National Stoplight Week. At any rate, just an amusing illustration of how these things go. 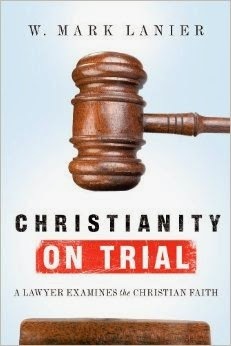 Book Snap: Mark Lanier's "Christianity on Trial"
For today we have another gateway apologetics book to consider, and this one's more of a familiar trope: Lanier is a well-known attorney who takes a legal approach to apologetics. How does he do? I can't say entirely, since only one chapter is within my expertise (on the Resurrection). I'll be sending this one to Nick Peters to evaluate the rest. What I can say for sure is that Lanier's presentation is satisfactory for a gateway book. It's not exactly the "hit 'em with evidence hard" approach, though; it's more of a methodological apologetic, with Lanier explaining in some depth how he would approach arguing his case if he were in court (for example, what witnesses he would call, and why). As an information guy, who has also worked in a law library, this was nothing new for me, but I can see how new readers would benefit. So by all means, give it a shot. Today we feature a guest post. Once upon a time, there lived a man who claimed to be a Christian and that he was a Preacher. “I spent fifty years in the Christian church and I pastored Evangelical churches for twenty-five years. (I preached for a total of thirty-three years),” he proclaimed. But, as Jesus related in the Parable of the Sower (Matthew 13), the preacher became like the seeds that fell on stony places. He rejected the Gospel and quit his Christian ministry. “The Church robbed me of so much of my life and I have no intention of allowing her to have one more moment of my time,” he wrote. He began a new ministry, preaching against the Gospel through his website. “Some may ask, since I am an atheist, why I bother with matters concerning the Bible and Christianity. First of all, I like talking about it,” he wrote (listing other reasons that we shall address later). And so, the Church continued to occupy his time. Are you born again? This is one of the most important questions in religion. Jesus Christ says, "Except a man be born again, he cannot see the kingdom of God"-John 3:3. It is not enough to reply, "I belong to the church; and I suppose I am." Thousands of nominal Christians have none of the marks and signs of being born again which the Scripture has given us. Would you like to know the marks and signs of being born again? Give me your attention, and I will show them to you out of the first epistle of John. First of all, John says, "Whoever is born of God does not commit sin;" and again, "Whoever is born of God sins not. "-I John 3:9; 5:18. A man born again, or regenerate, does not commit sin as a habit. He no longer sins with his heart and will and whole inclination, as an unregenerate man does. There was probably a time when he did not think whether his actions were sinful or not, and never felt grieved after doing evil. There was no quarrel between him and sin; they were friends. Now he hates sin, flees from it, fights against it, counts it his greatest plague, groans under the burden of its presence, mourns when he falls under its influence, and longs to be delivered from it altogether. In one word, sin no longer pleases him, nor is even a matter of indifference; it has become the abominable thing which he hates. He cannot prevent its dwelling within him. If he said he had no sin, there would be no truth in him (I John 1:8). But he can say that he cordially abhors it, and the great desire of his soul is not to commit sin at all. He cannot prevent bad thoughts arising within him, and short-comings, omissions, and defects appearing, both in his words and actions. He knew, as James says that "In many things we offend all" (James 3:2). But he can say truly, and as in the sight of God, that things are a daily grief and sorrow to him, and that his whole nature does not consent unto them. I place this mark before you. What would the Apostle say about you? Are you born again? Secondly, John says, "Whoever believes that Jesus is the Christ, is born of God"-I John 5:1. A man born again, or regenerate, then, believes that Jesus Christ is the only Savior by whom his soul can be pardoned; that He is the divine person appointed by God the Father for this very purpose, and that beside Him there is no Savior at all. In himself he sees nothing but unworthiness, but in Christ he sees ground for the fullest confidence, and trusting in Him he believes that his sins are all forgiven. He believes that for the sake of Christ's finished work and death upon the cross, he is reckoned righteous in God's sight, and may look forward to death and judgment without alarm. He may have his fears and doubts. He may sometimes tell you he feels as if he had not faith at all. But ask him whether he will rest his hopes of eternal life on his own goodness, his own amendments, his prayers, his minister, or his church, and see what he will reply. Ask him whether he will give up Christ, and place his confidence in any other way of religion. Depend upon it, he would say that though he does feel weak and bad, he would not give up Christ for all the world. Depend upon it, he would say he found preciousness in Christ, a suitableness to his own soul in Christ, that he found nowhere else, and that he must cling to him. Thirdly, John says, "Every one that does righteousness is born of Him"-I John 2:29. The man born again, or regenerate, then is, a holy man. He endeavors to live according to God's will, to do the things that please God, to avoid the things that God hates. His aim and desire is to love God with heart and soul and mind and strength, and to love his neighbor as himself. His wish is to be continually looking to Christ as his example as well as his Savior, and to show himself Christ's friend by doing whatever Christ commands. No doubt he is not perfect. None will tell you that sooner than himself. He groans under the burden of indwelling corruption cleaving to him. He finds an evil principle within him constantly warring against Grace, and trying to draw him away from God. But he does not consent to it, though he cannot prevent its presence. In spite of all shortcomings, the average bent and bias of his way is holy-his doings are holy, his tastes holy, and his habits holy. In spite of all this swerving and turning aside, like a ship beating up against a contrary wind, the general course of his life is in one direction-toward God and for God. And though he may sometimes fell so low that he questions whether he is a Christian at all, he will generally be able to say with old John Newton, "I am not what I ought to be, I am not what I want to be. I am not what I hope to be in another world, but still I am not what I once used to be, and by the Grace of God I am what I am." I place this mark also before you. What would the Apostle say about you? Are you born again? Fourthly, John says, "We know that we have passed from death unto life, because we love the brethren"-I John 3:14. A man born again, or regenerate, then, has a special love for all true disciples of Christ. Like his Father in heaven, he loves all men with a great general love, but he has a special love for those who are of one mind with himself. Like his Lord and Savior, he loves the worst of sinners, and could weep over them; but he has a peculiar love for those who are believers. He is never so much at home as when he is in their company. He is never so happy as when he is among the saints and the excellent of the earth. Others may value learning, or cleverness, or agreeableness, or riches or rank, in the society they choose. The regenerate man values Grace. Those who have most Grace, and are most like Christ, are those he most loves. He feels that they are members of the same family with himself. He feels that they are his fellow-soldiers, warring against the same enemy. He feels that they are his fellow-travelers, journeying along the same road. He understands them, and they understand him. He and they may be very different in many ways-in rank, in station, in wealth. What matter? They are Jesus Christ's people. They are his Father's sons and daughters. Then he cannot help loving them. Fifthly, John says, "Whatever is born of God overcomes the world"-I John 5:4. A man born again, or regenerate, does not make the world's opinion his rule of right and wrong. He does not mind going against the stream of the world's way, notions and customs. "What man will say?" is no longer a turning-point with him. He overcomes the love of the world. He finds no pleasure in things which most around him call happiness. He cannot enjoy their enjoyments: they weary him: they appear to him vain, unprofitable, and unworthy of an immortal being. He overcomes the fear of the world. He is content to do many things which all around him think unnecessary, to say the least. They blame him: it does not move him. They ridicule him: he does not give way. He loves the praise of God more than the praise of men. He fears offending Him more than giving offense to man. He has counted the cost. It is a small thing with him no whether he is blamed or praised. He is no longer the servant of fashion and custom. To please the world is quite a secondary consideration with him. His first aim is to please God. Sixthly, John says, "He that is begotten of God keeps himself"-I John 5:18. A man born again, or regenerate, is very careful of his own soul. He endeavors not only to keep clear of sin, but also to keep clear of everything which may lead to it. He is careful about the company he keeps. He feels that evil communications corrupt the heart, and that evil is for more catching than good, just as disease is more infectious than health. He is careful about the employment of his time: his chief desire about it is to spend it profitably. He is careful about the friendships he forms: it is not enough for him that people are kind and amiable and good-natured; all this is very well; but will they do good to his soul? He is careful over his own daily habits and behavior: he tries to recollect that his own heart is deceitful, the world full of wickedness, and the devil always laboring to do him harm; and, therefore, he would sincerely be always on his guard. He desires to live like a soldier in an enemy's country, to wear his armor continually, and to be prepared for temptation. He finds by experience that his soul is ever among enemies, and he studies to be watchful, humble, and prayerful man. Such are the six great marks of being born again. Let every one who has gone so far with me, read them over with attention, and lay them to heart. I know there is a vast difference in the depth and distinctness of these marks in different people. In some they are faint, dim, feeble, and hardly to be discerned. In others they are bold, sharp, clear, plain, and unmistakable, so that any one may read them. Some of these marks are more visible in some, and others are more visible in others. It seldom happens that all are equally manifest in one and the same soul. All this I am quite ready to allow. But still after every allowance, here we find boldly painted six marks of being born of God. Here is an inspired Apostle writing one of the last general epistles to the Church of Christ, telling us that a man born of God, Does not commit sin, Believes that Jesus is the Christ, Does righteousness, Loves the brethren, Overcomes the world, and Keeps himself. I ask the reader to observe all this. Now what shall we say to these things? What they can say who hold that regeneration is only an admission to outward church privileges, I am sure I do not know. For myself I say boldly, I can only come to one conclusion. That conclusion is, that only those people are born again who have these six marks about them; and that all men and women who have not these marks, are not born again. And I firmly believe that this is the conclusion to which the Apostle wished us to come. Reader, have you these marks? Are you born again? But still after every allowance, here we find boldly painted six marks of being born of God. Here is an inspired Apostle writing one of the last general epistles (1 John) to the Church of Christ, telling us that a man born of God, Does not commit sin, Believes that Jesus is the Christ, Does righteousness, Loves the brethren, Overcomes the world, and Keeps himself. I ask the reader to observe all this. 6If we say that we have fellowship with him, and walk in darkness, we lie, and do not the truth: 7But if we walk in the light, as he is in the light, we have fellowship one with another, and the blood of Jesus Christ his Son cleanseth us from all sin. 4Whosoever committeth sin transgresseth also the law: for sin is the transgression of the law. 5And ye know that he was manifested to take away our sins; and in him is no sin. 6Whosoever abideth in him sinneth not: whosoever sinneth hath not seen him, neither known him. 8He that committeth sin is of the devil; for the devil sinneth from the beginning. For this purpose the Son of God was manifested, that he might destroy the works of the devil. 9Whosoever is born of God doth not commit sin; for his seed remaineth in him: and he cannot sin, because he is born of God. 14 We know that we have passed from death unto life, because we love the brethren. He that loveth not his brother abideth in death. 15 Whosoever hateth his brother is a murderer: and ye know that no murderer hath eternal life abiding in him. 1 Whosoever believeth that Jesus is the Christ is born of God: and every one that loveth him that begat loveth him also that is begotten of him. 2 By this we know that we love the children of God, when we love God, and keep his commandments. 3For this is the love of God, that we keep his commandments: and his commandments are not grievous. 4 For whatsoever is born of God overcometh the world: and this is the victory that overcometh the world, even our faith. 5 Who is he that overcometh the world, but he that believeth that Jesus is the Son of God? In the above verses, the preacher imagined contradictions where none exist. “Denominations, pastors, and individual Christians explain, or should I say explain away, these verses in a variety of ways,” he stated. Who these people were, he didn’t say. The preacher raised the concepts of “explain” and “explain away” as if explanations were invalid, but did not support his assertion. For some reason, the preacher chose to ignore the explanations provided in Ryle’s text. Here, the preacher failed to take into account a concept called “context.” This was not a problem for Ryle. It’s a matter willfully ignored by the preacher. The question rises—Why? James Patrick Holding comments on the verse here: http://www.tektonics.org/lp/mansin.php, taking 1 John 1:8-10 and 1 John 3:5-8 into account. Who “they” are, the preacher didn’t say. He did not support his assertions. We therefore have no reason to believe him. “Keep in mind some scholars think 1 John is a fraudulent text,” the preacher wrote, but failed to substantiate. However, the authenticity and authorship of 1 John was affirmed by the following sources: Polycarp, Valentinus, Irenaeus, Clement of Alexandria, the Muratorian Canon, Tertullian, Origen, Eusebius, Codex Sinaiticus, Athenasius of Alexandria, Didymus the Blind, the Peshitta, and the Latin Vulgate. Ref. the hyperlinks from http://www.ntcanon.org/table.shtml. On this matter, they have credibility whereas the preacher and his unnamed scholars do not. Thomas Hartwell Horne. An Introduction to the Critical Study and Knowledge of the Holy Scriptures, Volume 4, 1877 edition. Edited by Thomas Hartwell Horne, John Ayre and Samuel Prideaux Tregelles. 14th edition, London: Longmans, Green, 1877. ON THE FIRST GENERAL EPISTLE OF JOHN. 2 Lardner's Works, 8vo. vol ii. p. 61.; 4to. vol. i. p. 311. 3 Ibid. 8vo. vol. ii. p. 99. j 4to. vol. i. p. 332. 4 Ibid. 8vo. vol. ii. p. 152.; 4to. vol. i. p. 362. 6 Ibid. 8vo. vol. ii. p. 168.; 4to. vol. i. p. 370. 7 Ibid. 8vo. vol. ii. p. 227.; 4to. vol. i. p. 403. 8 Ibid. 8vo vol. ii. p. 275.; 4to. vol. i. p. 429. 9 Ibid. 8vo. vol. ii. p. 481.; 4to. vol. i. p. 540. 10 Ibid. 8vo. vol vi. pp. 584, 585. j 4to. vol. iii. pp. 525, 526. 1Lampe. Commentarius in Evangelium Johannis, torn. i. Prolegomena, p. 104. Macknight's Preface to 1 John, sect. 2. Langii, Hermeneutica Sacra, pars ii. De Interpretation Epistolarum Johannis, pp. 167—175. “That conclusion is, that only those people are born again who have these six marks about them; and that all men and women who have not these marks, are not born again. And I firmly believe that this is the conclusion to which the Apostle wished us to come. The answer is up to the individual. After addressing the topic addressed by Ryle, the preacher’s mind wandered. He continued with contentions that, if he were competent at his job, he would know the answers. Nothing has been granted, since the preacher failed to support his assertions. Making no argument, the preacher offered nothing to address. The preacher admitted to being willfully ignorant, offering the following excuse: “Christians go to great lengths to smooth over and mediate the conflict, but since I am not a Christian I have no need to make everything ‘fit,’” For some reason, the preacher states a conflict without stating what the conflict was. The preacher’s mind wandered further, entering the territory of hypothetical assertions, as if he didn’t know the difference between hypothesis and evidence. “I ask myself, if a person who had never had any contact with Christianity was stranded on an island and only had the book of 1 John to read, what conclusions would they come to? Remember, Christians tell us the gospel is simple and clear enough that even a child can understand it. I wonder if a person who had never had any contact with Christianity was stranded on an island and only had the Bible to read what conclusions would they come to?” the preacher asks. This is from a man who spent 35 years in the ministry, yet remains incompetent in dealing with these questions. Astonishingly, these verses eluded the 35-year preacher’s mental grasp. His mind continued to drift into the Land of Missing the Forest for the Trees. Was this preacher mentally competent? What proof did the preacher offer that this definition has changed? Zero. “I suspect the essence and nature of the Christianity of Jesus has been irretrievably lost. (perhaps the Gnostics were the real Christians),” according to this preacher, who has discredited himself a great deal in this discussion. “It cannot be too strongly asserted that in substance the text of the Bible is certain: Especially is this the case with the New Testament, of early translations from it, and of quotations from it in the oldest writers of the Church, is so large that it is practically certain that the true reading of every doubtful passage is preserved in some one or other of these ancient authorities. This can be said of no other ancient book in the world. Who has greater credibility, an archaeologist like Kenyon, or a preacher who is willfully ignorant? What standard this is, the preacher neglected to define. It is a challenge, however, that Christianity can meet. Simon Greenleaf, Royall Professor of Law at Harvard, wrote, “All that Christianity asks of men on this subject is that they would be consistent with themselves; that they would treat its evidences as they threat the evidence of other things; and that they would try and judge its actors and witnesses as they deal with their fellow men, when testifying to human affairs and actions, in human tribunals. Let the witnesses be compared with themselves, with each other, and with surrounding facts and circumstances; and let their testimony be sifted, as if it were given in a court of justice, on the side of the adverse party, the witness being subjected to a rigorous cross-examination. The result, it is confidently believed, will be an undoubting conviction of their integrity, ability, and truth. In the course of such an examination, the undesigned coincidences will multiply upon us at every step in our progress; the probability or the veracity of the witnesses and of the reality of the occurrences which they relate will increase, until it acquires, for all practical purposes, the value and force of demonstration.” From An Examination of the Testimony of the Four Evangelists, by the Rules of Evidence Administered in Courts of Justice with an Account of the Trial of Jesus, online at http://www.classicapologetics.com/g/GreenTes1.html. Alas for the poor preacher, he failed to comprehend Ryle’s full essay, and the context of the Scriptures he and Ryle presented. The argument has been countered; the preacher’s sophistry has been exposed. One wonders whether this preacher—avoiding Ryle’s discussion of “born again”--actually knows what the Gospel is. Answer: Read the verses in context. Read Ryle in context, as well as the essays by J. P. Holding and Matt Slick. The moral of the story: Learn to comprehend what you read.